Red Bull Malaysia’s nationwide contest – ‘Start Right, Charge Ahead’ – ended with the announcement of 904 winners, who took home a total of RM250,000 over the course of 76 days. The contest capitalised on Red Bull’s new brand tagline, to encourage the consumption of its energy drink before the start of any activity for that extra boost of stamina and mental focus. On-going for 76 days, the contest received overwhelming response from participants. 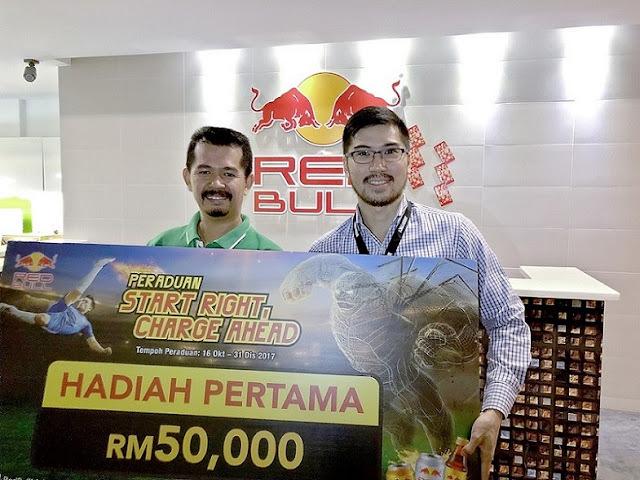 Towards the end of the contest period, Red Bull selected four entries and awarded RM50,000 to the grand prize winner; RM10,000 to the second prize winner; and RM5,000 each to two third prize winners. Mohd Shukri bin Zakaria, the astonished grand prize winner who walked away with RM50,000 said: “As an avid Red Bull consumer, I always turn to this energy drink whenever I need a quick energy boost. Working as a school teacher for the past 20 years, my job requires me to stay productive for long hours and to keep up with my students. To ensure I perform well and give my students my best, I drink Red Bull before I start work, as it enables me to concentrate better. But who would have thought that I would win RM50,000 because of this! I am so excited to be chosen as the grand prize winner. As this is a life-changing event, I will be saving the prize money in my bank account for my family’s future. The premise of Red Bull’s ‘Start Right, Charge Ahead’ campaign was to redefine the most effective consumption manner for its energy drink, which is to begin each activity with Red Bull, so consumers have the mental focus and physical stamina to yield the best results from their activities. Samathivathanachai added: “Consumers usually consume Red Bull during or after an activity, but throughout this campaign, we wanted to educate them that Red Bull should be consumed before the start of any activity – be it work, sports, driving or studying. This is so that they are provided with the right fuel to perform optimally in all the tasks they undertake. To participate, consumers were required to purchase two cans of Red Bull, test their skills by answering a question and submit their entries through mail-in, SMS or social messaging, or online. Red Bull is available at all major convenience stores, petrol marts, independent grocers, supermarkets and hypermarkets at a recommended retail price of RM 3.10 for the gold and 25% less sugar canned variants and RM 1.80 for the bottled packs. To find out more about Red Bull, please visit www.redbull.com.my or www.facebook.com/RedBullMalaysia.